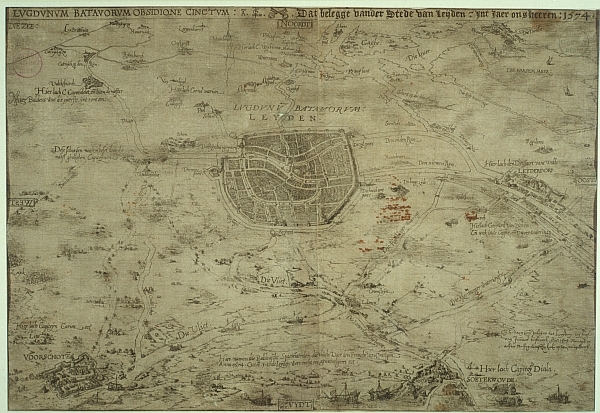 The map shown here is printed just after the relief of Leiden 'at the house of Johannes Liefrinck'. It is one of the first printed plans of the town. It is primarily a news print that vividly shows the locations of the troops, the Beggars' ships and the fleeing Spanish soldiers. This print, of which only one copy has survived, served as a model for the plan of Leiden in the famous town atlas of Braun and Hogenberg, that was published in Cologne in six volumes, from 1572 onwards. This year, the theme of the Dutch Heritage Days in Leiden is 'Leiden op de kaart' (Leiden on the map). On 12 September 2009, the University Library is one of ten institutions that form a special map route along cartographic collections in Leiden. In the Special Collections Reading Room, a pop-up exhibition will show the town of Leiden as a map production centre. Among the exhibits are maps and atlases of Leiden publishers like Pieter van der Aa and Plantin; also attention is paid to surveyors and map-makers like Jan Pietersz. Dou, Pieter Bast, Franz Phillip von Siebold and J.E. van Gorkum, who all lived and worked in Leiden.